Manxgirl living and crafting down under. : A new start. All the little finishes lately must mean I can have a new start. The Christmas Story quilt is all but done. I just need to close the binding, then I'll get a photo taken. I have some Christmas ornaments prepped and ready for some slow stitching and of course my cross stitch dragonfly is taking long naps in the drawer by my chair. But all of that is for in the sitting room, while watching tv. I need something for in my play room, and here it is. Some years ago I asked Santa to bring this beauty along. It sat for a while in a drawer, moved house, moved across the world and moved house again! Now it just might get its chance. The pattern is Spring Sprouts, by Laundry Basket Quilts. The kit contains all the batik fabrics I'll need to make the top, and all of the applique pieces are precut with fusibles already in place and even presorted into numbered bags for a quick and easy start. 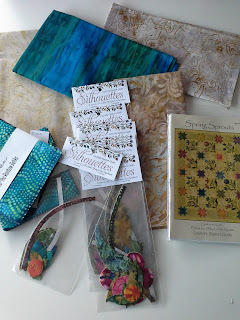 I took one of the charm packs into the sewing shop the other day a bought plenty of matching threads and two large reels matching the background fabrics. Hopefully today is the day - you deserve to start something new with your finishes :-) And that lovely sounding roject deserves to finally see the light of day! What a great pattern. Having all the appliqué pieces ready to go makes life so much easier. I'm looking forward to seeing this one progress. A new project - sounds good to me! Love Edyta's style and lucky you for the wondrous gift from Santa! Have fun.